When one spouse files for divorce, it kicks off a legal back-and-forth that may remind you of how a lawsuit progresses. That's because a divorce filing is, in fact, a lawsuit. One spouse is suing the other for divorce, as well as for certain property and, if there are children, specific custody arrangements. The initial filing is called the "petition" or "complaint." The next move is up to the other spouse. Assume that you are the one filing for divorce. Before anything can happen, your spouse has to be served with the petition; that is, the petition has to be received by your spouse in a way that can be verified by the court. Every state has its own, very strict rules about what constitutes proper service. Once he receives the petition, your spouse has a short period to file a response, or "answer," usually 30 days. The answer provides his position on the same information that you included in your petition. He should address each of your demands, point by point, accepting them or rejecting them and issuing a counter-demand. Your spouse could also choose to do nothing. If the deadline passes and he has not filed an answer, the court will assume that he agrees to the terms in the petition and will issue a default judgment in your favor. That means you get everything you asked for. At this point, "discovery" begins. 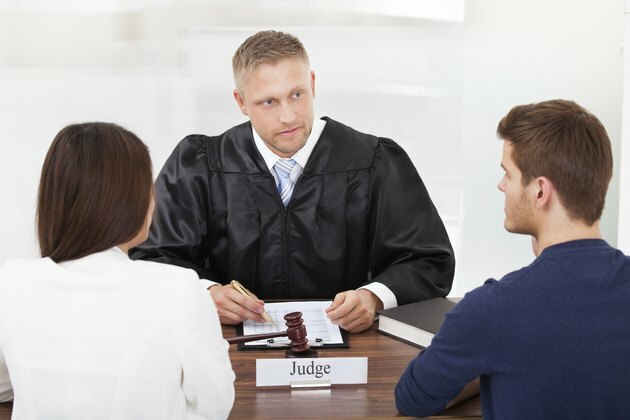 This is the process in which you and your spouse exchange all information relevant to the divorce. Your lawyer and your spouse's lawyer will also conduct investigations to see if there's anything about which one of you hasn't been forthcoming. According to FindLaw.com's Divorce and Family Law Center, you should expect everything to come out. If one of you is hiding money, has been unfaithful, has a gambling problem, as examples, assume that the lawyers will sniff it out. At any point in the process, you and your spouse can sit down--with your lawyers, of course--and try to work out an agreement on the issues at hand. If you can reach a deal that's satisfactory to both sides, you draw up the terms in a "marital settlement agreement" and submit it to the court. According to legal information site Nolo.com, the judge will almost certainly approve it. In the vast majority of divorce cases, the parties reach a settlement. If you and your spouse can't, then you're going to court. The final step is a trial. Both spouses will testify and undergo cross-examination. Your lawyers will call witnesses and present documents, just like in any other civil trial. At the end, the judge--and in nearly all cases, it's a judge, not a jury--will grant the divorce and rule on the division of assets. There's an alternative. If you and your spouse can agree beforehand on all the terms of the divorce, you can file the divorce papers together, along with your marital settlement agreement. You may even be able to do it without a lawyer, or you could both use the same lawyer. This is called an uncontested divorce, and it saves considerable time, money--and anguish.